"Kinō Nani Tabeta?" is a TV series that is produced and broadcast by TV Tokyo. It's based on the comic series of the same title. The main characters are Shirō Kakei acted by Hidetoshi Nishijima and Kenji Yabuki acted by Seiyō Uchino and they are a gay couple. In the series, their eating habits are mainly described rather than their position in Japanese society. Shirō is a lawyer and usually goes to discount supermarkets after leaving the office to buy foods as cheaply as possible. Then he returns home and starts cooking dinner. When his partner Kenji who is a hair stylist comes home, they sit down to table together. Kenji really loves and enjoys eating the dinner cooked by Shirō. Shirō is a methodical and an economical man while Kenji is good at dealing with things, friendly and thinks everything loosely. Though Shirō doesn't tell his co-workers that he is a gay, Kenji tells his customers that he loves a man and lives with him. One day they quarrel with each other about it but they finally make it up and Shirō cooks their dinner. On the 1st of April, a new era name (gengō) was announced. No, it's not April fool. The new one is "Reiwa" and will be used during the reign of next emperor. The new name derives from Man'yōshū, an anthology of the poems by the Imperial family, aristocrats, public officials and common people. The first gengō in Japan is Taika in the 7th century. In former times, gengō was often changed because of a natural disaster or a civil war. Until the end of the Tokugawa shgunate, the emperor could change gengō any number of times for the above reason. But in Meiji period the system of "each emperor one era system" was established and it was legislated. Japan is the only country that uses gengō at present though it was widely used in East Asian countries until the 20th century. This is a continuation of Manpuku. In 1970, Expo'70 is held in Osaka and Manpei Tachibana plans to develop a new product. The product is also a noodle but it's contained in a kind of paper cup and it can be eaten even in the outdoors. This is modeled on Cup Noodles. Then he tries to concoct soup for the product and occupies the kitchen in his house. It astonishes his mother-in-law Suzu who lives with his family includes her daughter Fukuko. And Gen, son of Manpei and Fukuko works at his father's company Manpuku Foods and is a member of the project team of the product. He is confused that he cannot keep up with Manpei who is a genius inventor and worries about it. Not only him, other members of the team puzzle over how to develop the new noodle and its container. Manpei who learns the worries of Gen from Fukuko changes his plan a bit. Sachi, younger sister of Gen is on friendly with an American boy called Leonardo who visits Japan to see the expo. It also astonishes Suzu. And Katsuko Kōda, elder sister of Fukuko bother about her family especially Daisuke, son of her daughter Taka and Shigeru Kanbe who also works at Manpuku foods. Under such circumstances, Manpei's new product will be launched soon. 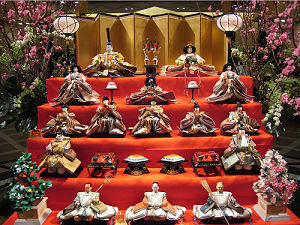 Hinamatsuri is the third of March and is also called Doll's Day, Girls' Day or Doll's Festival. On the day the Japanese celebrate the growth of girls. It's one of the go-sekku, five annual　ceremonies in Japan that was introduced in former times to Japan from China. On the day, a set of hina-ningyo is displayed. There are various kinds of hina-ningyo and　some of them are so gorgeous. The set is interited from generation to generation. The full set of hina-ningyo has two dolls (dairi-bina) described as the Emperor and the Empress or a prince and a princess consort, court ladies, musicians, ministers, servants, oxcart, furniture, bonbori (paper lantern) and so on. Hishi-mochi, a kind of sweet that is formed from three layers of pink, white and green rice cake is displayed also. They are usually displayed on a tiered-stage covered with red carpet. Though the day is not a national holiday, many people celebrate the day by eating a broth containing clams and chirashizushi, sushi rice in a box or bowl whose top is sprinkled by various ingredients. Peach blossom is essential to celebrate the day. Peach is said to have medical property and was regarded as miraculous fruit in ancient China. The TV series is based on the novel by Jun Ikeido and was broadcast in 2017. The main character is Kōichi Miyazawa who is the fourth president of a long-established company of tabi in Gyōda, Saitama. However the business performance continues to hang low and he suffers financial embarrasments. Then he plans to make running shoes using the skill of making tabi. Though he faces the finaicial difficulties, a lack of workers and the pressure of a major sporting goods manufactur, he still tries to make new-style shoes. As the series is set in a tabi company, Kōichi mentions Shisō Kanakuri who wore tabi when he ran in the races. And the role of Kōichi is played by Kōji Yakusho who acts Jigorō Kanō in "Idaten" but I prefer this series. 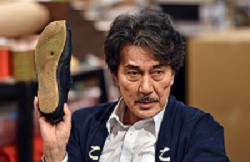 The word "Rikuoh" (Riku-ō) is the name for the shoes Kōichi plans to make but it's originally the name of a trial product of a pair of sport shoes made by his predecessor. Setsubun is the 3rd of February in Japan. And the following day is called Risshun, the first day of spring in the lunar calendar. In former times, Risshun was regarded as the first day of the year so Setsubun was regarded as the New Year's Eve. People believed that sceptres appeared in the turn of the season so there were and still are various ways of exorsising evil spirits. This custom was introduced to the Imperial Court in the eighth century, and then became popular. Grilled head of sardine and a twig of holly are widely used as protection from harm. And scattering beans is well-known. This is called mamemaki in Japanese and people scatter beans shouting "Oni wa soto, Fuku wa uchi (Out in the demon! In with the fortune!)". After scattering, each of them eats the beans equal to his or her age. Recently the beans for mamemaki is sold in plastic packs taking eating them after scattering in consideration. Some famous people are invited to shrines and temples to scatter the beans. Such beans are used for divination also. In many regions, the food for Setsubun is prepared. Some people visit shrines and temples on the day. This custom reminds me of Halloween in the Western world or Yule in Scandinavia. In fact, children visit other houses and shops to ask sweets in some areas of Mihara, Hiroshima. It is similar to "Tricks or Treats!" in Halloween. And those who visit shrines and temples wear the clothes that is different than usual to protect themselves from harm. Not only Setsubun, there are some customs in Japan that are similar to those in the Western world also. Like Krampus of Europe, Namahage punishes bad children on the New Year's Eve in Akita region. This is the plot of "Shibahama" mentioned in the post on the 4th episode of "Idaten". There was a man called Katsugorō. He was a peddler of fish and sold them well but he loved drinking sake very much. Because of this, he sometimes made a mistake and lived in poverty. One morning his wife got him out of bed so he went to buy in fish at a fish market in Shiba (Shiba, Minato-ku, Tokyo today). However it was too early so he washed his face at the beach (Shibahama) at twilight time and had a smoke. Then he found a leather purse at his feet and there was a large amount of money in it. He ran very fast to home and had a party with his friends. He drank sake heavily. On the following morning, He who had a hangover was told by his wife that they had no money to pay for the sake he and his friends drank. He told her about the purse he picked up but she said that she didn't know about it. She also said that it was his dream. He looked for it but could not find it. So he thought it was a dream and made up his mind to give up drinking and set about his business in earnest. From then on, he worked well and opened his shop on the main street three years later. His life became stable and had same saving. On the New Year's Eve of the year, he thanks his wife for having supported him and bows his head to her. Then she spoke about the purse he picked up three years ago. In reality, it was not his dream. She felt confused when she was shown a purse with a large amount of money. At that time, pocketing big money was a capital crime so she tried to avoid it. She consulted with the owner of the tenement house they live in about it. Then she told him it's a dream and he didn't pick up any purse. But the owner of the purse didn't appear so it was given to him. "I will stop drinking. I don't want to make this kind of happiness a mere dream". "Manpuku" is a series of so-called "Asadora", morning drama series produced and broadcast by NHK. The main characters Fukuko and Manpei are modeled on Masako and Momofuku Andō. Momofuku Andō invented instant noodles. In this series, Fukuko is the third daughter of the Imai Family and works at a hotel after graduating from Jogakkō, a high school for girls from Meiji period till 1948. Then she meets a strange man called Manpei Tachibana and they get married. But Manpei is falsely accused and the war breaks off. Fukuko, Manpei and Fukuko's mother Suzu evacuate to countryside. Manpei cannot go to the front because of the condition of his health. 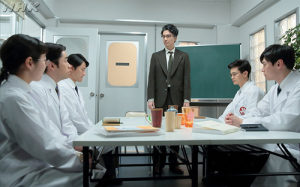 After the war, Manpei is engaged in some business but end in failure. In 1950s he becomes a chairman of a credit association. However the association goes bankrupt and he goes broke. One day, he thinks out a plan of instant noodles when he has dinner. Not only Fukuko, Manpei and their children but their relatives and friends appear also. Fukuko is described as a cheerful woman who always supports her husband while Manpei is a rather eccentric man who absorbes in one thing. Sakura Andō plays the role of Fukuko and Hiroki Hasegawa acts Manpei. Hasegawa will feature in "Kirin ga Kuru", a Taiga Drama series in 2020. 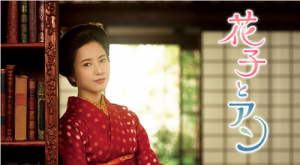 This is an Asadora (the morning drama series produced and broadcast by NHK) broadcast from April to September 2014. It is written by Miho Nakazono, a scriptwriter who writes "Segodon" and describes the life of Hanako Muraoka who translated "Anne of Green Gables" into Japanese for the first time in Japan. She was born in Yamanashi and was educated at Toyo Eiwa Jogakkō, a private school for girls established by a missionary of the Methodist Church in Canada. In this series, the main character is Hana Andō (later Hanako Muraoka) who is born as the eldest daughter of a farmer. Though her family is so poor, she is interested in "Thumbelina" her father bought for her and enters a primary school. Then she goes to Tokyo and enters Shūwa Jogakkō modeled on Tōyō Eiwa Jogakkō as scholar. She learns English there and made some friends includes Renko Hayama who is modeled after Byakuren Yanagihara, a poet who is a cousin of Emperor Taishō. She takes an interest in translation when she works at a part-time at a publisher called Kōgakukan. After graduating, she goes back to Yamanashi and teaches children but returns to Tokyo and works at Kōgakukan as editor. Later she was given the original work of "Anne of Green Gables" by her former teacher. and decides to translate it. Both the main characters of the series and "Segodon" are born in a family that are not wealthy and experience difficulties in their young days but realised their wishes.